Encompassing Nashville, Murfreesboro, and the surrounding regions. It’s not a protest. It’s a prayer meeting. Bound4LIFE is a grassroots prayer mobilization movement targeting the ending of abortion, the increase of adoptions, and the sending of revival to reform government and culture. A Silent Siege is just this—a stand in silent prayer on behalf of a nation that is aborting its children. We are standing in agreement with Jesus, the Great Intercessor, concerning the holocaust of abortion. We believe the Life Tape is a divine strategy from the Lord to both mobilize a massive movement of prayer and also to be a faithful witness to the nation. The red Life Band that we wear is not a fad or a fashion statement. In fact, it is an outward marking of an internal conviction. We wear this band in unity and as a reminder of a solemn commitment that we have made—a lifestyle that we have entered into willingly. The Life Band Commitment developed out of a great desire to see the body of Christ make a deliberate, unified effort to work towards ending abortion. The covenant has three parts—Pray, Vote and Obey. Bound4LIFE invites you to get a Life Band and make this solemn commitment. We make our appeal to the Judge of the earth and ask Him for speedy justice to be released. God’s people are called to be a voice for the voiceless and a defense for the defenseless. What does that look like in a contemporary culture? How are these mandates walked out effectively? While the principles of scripture remain unchanged throughout the ages, God often releases divine strategies for their application in order to impact culture effectively. Undoubtedly, there is no one poorer or more needy than babies in the womb who have no voice to defend themselves. In 2004, after 50 days and nights of round-the-clock corporate prayer and fasting, a large group of praying believers, packed up their sleeping bags and headed to Washington, DC. They were filled with faith and confidence that prayer could change the course of the nation. Their goal: To exalt JESUS in the nation’s capitol, to see ABORTION end, and to contend for a GREAT AWAKENING in every sphere of society. Unexpectedly, the silence of the LIFE Tape has had a profound impact. Truly, a picture has been worth a thousand words. Nearly every media news source has taken hold of this image and spread it everywhere. It has quickly become a phenomenon that catches the eyes and hearts of the world. It has been said, “Life Tape subpoenas the conscience of the nation.” The witness of the Life Tape has spread further and impacted more people than we ever could have by shouting on a street corner. Political leaders and public policy have been directly impacted. Young women seeking abortions have experienced the love of God and chosen not to abort their babies. Laws are changing, and the lives of the babies are being saved. 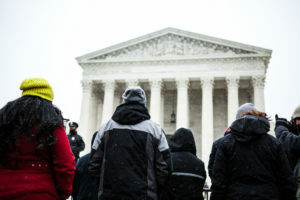 If you go to the Supreme Court today, you’ll find faithful people of prayer still there. 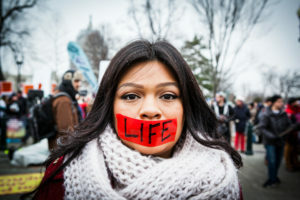 Through rain, blizzards and scorching heat we have never abandoned this “Silent Siege” against the ideology of abortion—against dark political agendas—against the spiritual power structures that prop up the abortion industry (Ezekiel 4:1-3). We are there until the decree of death is reversed. You can be a part of this movement now right where you live. Please click HERE to receive more information, times, dates, and locations about our upcoming Silent Siege.